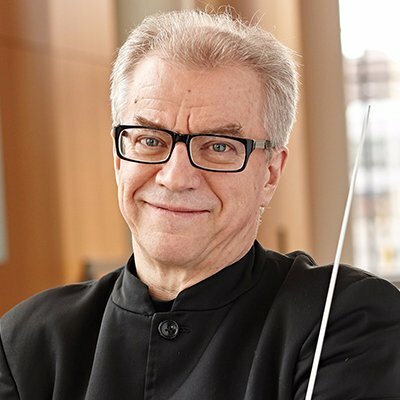 Music Director of the Minnesota Orchestra for 15 years, Osmo Vänskä has led the Orchestra on five major European tours, as well as historic trips to Cuba in May 2015, at the invitation of the Cuban Ministry of Culture, and South Africa in August 2018 as part of the world-wide celebration of Nelson Mandela’s Centenary. Other key highlights include the complete recordings of Sibelius and Beethoven symphony cycles — winning a Grammy Award in 2014 for ​‘Best Orchestral Performance’ (Sibelius symphonies 1 and 4), and the forthcoming cycle of Mahler symphonies, of which one disc already garnered a Grammy nomination in 2018. In great demand as a guest conductor, in 2018/19 he has re-invitations to the Chicago and New World symphonies and the Seoul Philharmonic Orchestra and will return to China working with the Shanghai Symphony Orchestra, and the China, Hangzhou and Hong Kong philharmonic orchestras. In Europe he will make his regular appearances with Helsinki Philharmonic Orchestra and work with Deutsches Symphonie-Orchester Berlin, Netherlands Radio and London Philharmonic orchestras, and Iceland Symphony Orchestra, where he has been Principal Guest Conductor since 2014. Last season Vänskä made his debuts with Rundfunk-Sinfonieorchester Berlin, SWR Sinfonieorchester, Toronto and National Taiwan symphony orchestras, and returns to Orchestre de Paris, San Francisco Symphony, and the Seoul and Helsinki philharmonic orchestras, amongst others. A distinguished recording artist, primarily for the BIS label, his most recent recordings are of Mahler’s Symphonies No. 5 and 6, with the Minnesota Orchestra, to be followed later this year by Symphonies No. 2 and 1, continuing the cycle dedicated to the composer. With Minnesota he has recorded the complete Beethoven and Sibelius symphony cycles, also for BIS, to rave reviews internationally; while recordings of Beethoven’s piano concertos with Yevgeny Sudbin, have also garnered worldwide praise – including Grammy and Gramophone award nominations.